Many persons with diabetes in the United States are receiving care too late to prevent visual impairment, although improved therapies for diabetic macular edema (DME) are now available, according to a cross-sectional analysis published online December 19 in JAMA Ophthalmology. Clinicians need to educate their patients with diabetes that the disease can affect their eyes because DME can lead to substantial vision loss if it is untreated for a year or more. The study goal was to evaluate eye care and awareness of eye disease among persons with DME in the general US population, using data from the 2005-2008 National Health and Nutrition Examination Survey (NHANES). Included in this analysis were participants who were at least 40 years of age who had diabetes mellitus and fundus photographs. Study endpoints in persons with DME were awareness that diabetes had affected their eyes, the interval since they visited a diabetes specialist, report on their last eye examination with pupil dilation, and prevalence of visual impairment, defined as visual acuity worse than 20/40 in the eye with DME. 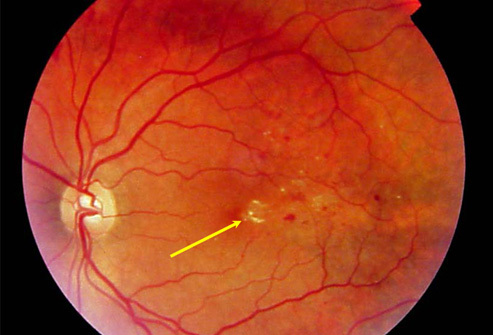 “The data suggest there are hundreds of thousands of people in the United States, among the approximately three quarters of a million people who have [DME] due to diabetes damage on blood vessels within the macula, who are not getting care that can prevent visual impairment and blindness,” Dr. Bressler, who is also editor of JAMA Ophthalmology, told Medscape Medical News. “Among 798 persons with self-reported diabetes mellitus in the analytic sample, 238 had diabetic retinopathy without DME and 48 had DME, the authors write. Among included participants with DME, less than half (44.7%; 95% confidence interval [CI], 27.0% – 62.4%) reported in 2010 that they had been told by a physician that diabetes had affected their eyes or that they had retinopathy. Nearly half (46.7%; 95% CI, 27.5% – 66.0%) reported that their most recent visit for diabetes checkup with a diabetes nurse educator, dietician, or nutritionist was longer than 1 year ago or never. In the last year before being surveyed, 59.7% (95% CI, 43.5% – 75.9%) reported having undergone eye examination with pupil dilation. On the basis of visual acuity at the initial examination, 28.7% (95% CI, 12.7% – 44.7%) were visually impaired, as were 16.0% (95% CI, 2.5% – 29.4%) according to best-corrected visual acuity. Dr. Bressler also recommends additional research to identify such strategies. “Options to improve the number seeking retinal evaluation on a timely, consistent basis should be studied,” Dr. Jampol said. Study limitations noted by the authors include the relatively small number of NHANES participants with DME, reliance on self-report for eye care questions, use of fundus photographs that were not stereoscopic pairs, and lack of optical coherence tomography data to determine the proportion of cases with central macular thickening among those in whom DME was or was not suggested by retinal photographs. Genentech Inc and Roche supported this study by a grant to the Johns Hopkins University. Genentech Inc provided support for third-party writing assistance for the journal article and employs 3 of its authors. Dr. Bressler was not involved in the editorial evaluation by JAMA Ophthalmology or in the decision to accept the article for publication. He has reported financial disclosures involving Bausch & Lomb Incorporated, Bayer Healthcare, ForSight Labs, Genentech Inc, Genzyme Corporation, Lumenis Inc, Notal Vision, Novartis Pharma AG, Optovue Inc, Regeneron Pharmaceuticals, and the National Institutes of Health. Some of the other study authors reported various financial disclosures involving Allergan, Aquesys, Genentech Inc, Merck, Replenish, and/or Outcomes Insights Inc. Dr. Jampol has disclosed no relevant financial relationships.